At the end of “The Ocean at Home: An Illustrated History of the Aquarium” the author Bernd Brunner admits to trouble in paradise, and offers this quote from the son of Phillip Henry Gosse, writing about his father in 1907. Gosse was a popularizer of the aquarium in the mid to late 19th century, and his books and lectures contributed to a craze in home aquariums. This led, of course, to a massive plundering of sea life from seashores around the world. The ring of living beauty drawn about our shores was a very thin and fragile one. It had existed all those centuries solely in consequence of the indifference, the blissful ignorance of man. These rock-basins, fringed by corrallines, filled with still water almost as pellucid as the upper air itself, thronged with beautiful sensitive forms of life, – they exist no longer, they are all profaned, and emptied, and vulgarized. An army of “collectors” has passed over them, and ravaged every corner of them. The fairy paradise has been violated, the exquisite product of centuries of natural selection has been crushed under the rough paw of well-meaning, idle-minded curiosity. That my father, himself so reverent, so conservative, had by the popularity of his books acquired the direct responsibility for a calamity that he had never anticipated, became clear enough to himself before many years had passed, and cost him great chagrin. These two photos (one above, one below) were taken at Salt Point in 2013. 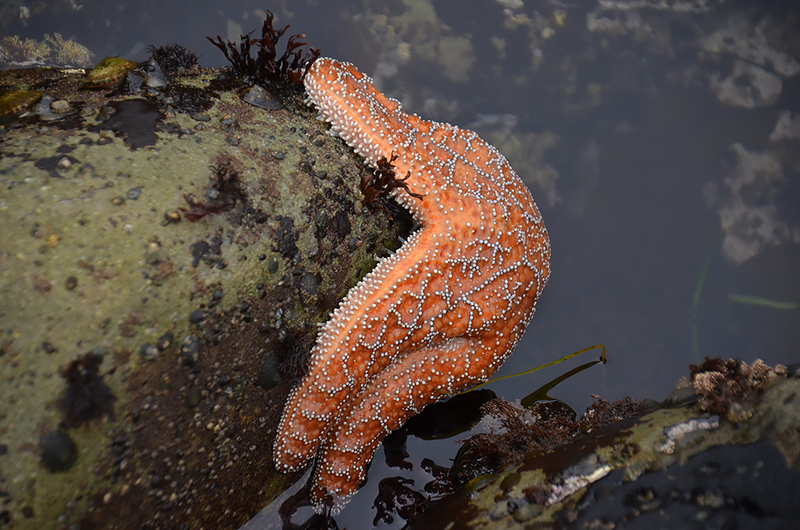 It was a pretty standard sighting of starfish, then, but I’ve hardly seen more than a tiny handful of starfish since.